The FAA Airman Certification Standard, envisioned at the SAFE Pilot Reform Symposium in 2011, is now FAA policy for pilot certification. New pilots now learn and demonstrate risk management in an integrated curriculum right from their first day of pilot training! Our Pilot Proficiency Program, started by Doug Stewart and others at SAFE in 2012, has become a national hit and the highlight of Oshkosh every year. 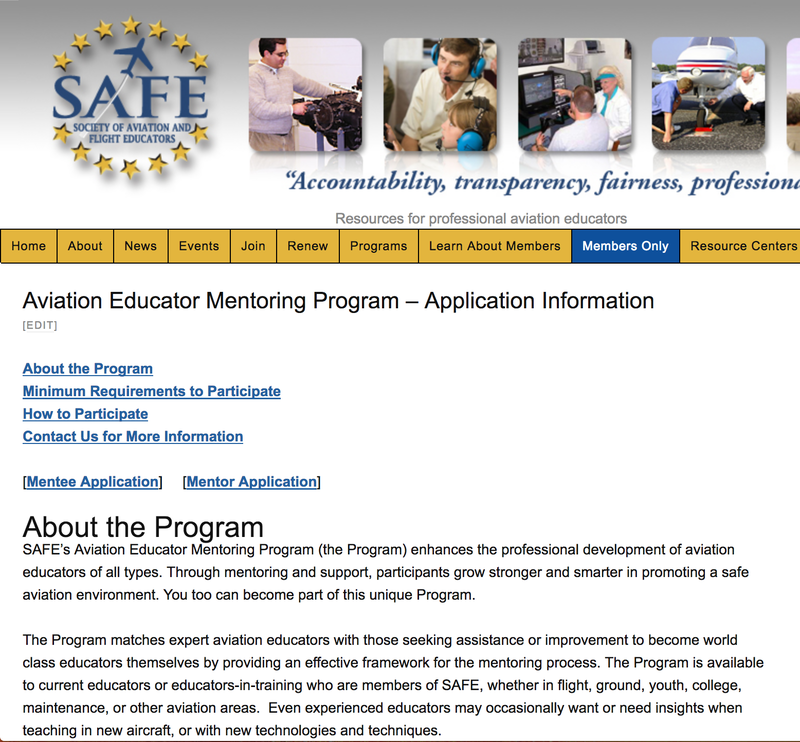 SAFE is now focusing more intently on improving the level of professionalism of our aviation educators; this includes all CFIs and educators in all parts of aviation. There are far too many individuals in our industry who have acquired FAA teaching credentials and do not achieve (or maintain) the required professional standards to educate effectively and thoroughly. Every pilot and CFI reading this has experienced (and paid for) this depressing “educational experience.” Just focus on your memory of this for a moment and imagine if it was your first exposure to aviation. It is no wonder, new pilot candidates are dropping out at an 80% rate in our flight schools. Please refer to Rod Machado’s blog on this topic or see our recent post on professionalism here. Every one of these individuals potentially provides initial and remedial training to a large number of pilots every year. The required one hour of flight time for a flight review every two years is often a perfunctory “rubber stamp” with no true value. Imagine if each of these low functioning CFIs was teaching at a more professional level how much safer all our pilot population would become. In the US, any commercial level pilot can acquire a CFI (plus CFII and MEI) certificate in a 10-14 day course and be teaching new pilots the very next day (potentially even in a twin)! Additionally, the CFI responsible for teaching these new CFI students is only required to have 200 hours of instructional time and no particular added pedagogical experience. The professionalism of our US aviation system runs entirely on personal integrity and this system is failing badly. If each of these new CFI graduates entered a mentored education environment, this system might work acceptably. Unfortunately many new CFIs are hired teach entirely on their own and have to figure it out as they go! In Canada, flight instructors have four levels. A beginner Class 4 instructor can only teach under the supervision of a higher Class 2 or 1 instructor. Additionally, to instruct a potential CFI in Canada you must be a Class 1 instructor with years of proven experience. This insures that only experienced professionals are teaching the new instructors. In the US, our aviation “puppy mills” are churning out “hour builders” who use their new credentials to build required experience for their future careers in an unsupervised environment. The common joke “your first five students will teach you how to be a CFI” are unfortunately not far from true in the US. On the other side of life, we have many retired professional 121/135 pilots returning to the education system after years of line flying. These individuals retain a CFI certificate with the minimal $99 online renewal every two years and “teach” at whatever level they maintain. Often these professionals crave a refresher but have no options to refresh their skills in our industry (we hope to change that at SAFE). In our FAA marketplace, some CFIs are wonderful and some are terrible all depending on personal ability and integrity, there is absolutely no verification of professionalism. Largely for this reason, JoAnn and Sandy Hill created the Master Instructor Continuing Education Program in 1995. Master Instructors are highly vetted, peer reviewed professionals that are also active aviation citizens giving back to our industry. The rigorous requirements of this certification are well recognized in our industry and raise these individuals to a professional level of Master Instructor. Look for our new initiatives to “raise the bar” on CFI professionalism rolling out this year. And please offer *your* suggestions to improve our efforts! CFIs are the secret sauce for safety in our industry that touch every pilot every day. They do this either by providing instruction or in the example the set in our community. Each aviation educator needs to teach with integrity and maintain the highest level of skill, knowledge and judgment. Step up to CFI professionalism with SAFE in 2017…and have a great year! Previous Previous post: “CFI Pro!” The Critical Element in Pilot Training!